“Steve thanks for all the miracles you have performed for me this year, without them I would have never have won the World Cup.” Elite Athlete Greg Bennett, World Champion, Triathlete *. Steve provided massage therapy and back pain treatments to Belinda Gladstone for years. 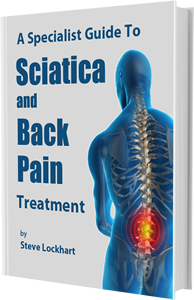 Watch the video to see what can be done about Lower Back Pain, Back Pain or Sciatica. Please note: Results are not typical and may vary depending on the effort and time they are done and also on a person's age, condition and general health. People who carry out the exercises and follow the advice on this site do so at their own risk and those with existing health conditions should always consult their Doctor before they undertake the exercises in the programs or videos contained on this site. Watch the video above to see what can be done about Lower Back Pain, Back Pain or Sciatica.